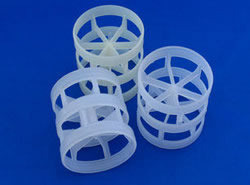 This product was advanced on the basis of Plastic Raschig Ring, and compared with it, both of them have similarcylindrical dimensions but the Plastic Pall Ring has two rows of punched out holes.Plastic media combines a high surface area for aerobic or anaerobic biological treatment of waste water with excellentliquid distribution and high void age . Founded in the year 1994, in Ahmedabad (Gujarat, India), we, “Swami Enterprise” are a well-known manufacturer and supplier of an exclusive range of Air Pollution Control Equipment, Industrial Blower, Chemical Reactor Vessel, Chemical Storage Tank, etc. Since our establishment, we are continuing with our commitment to explore and test all new plastic materials, acquire state-of-the-art plastic processing equipment, sourcing of plastic commodities in the marketplace and innovative engineering and utmost quality in manufacturing. We are known in the industry as a diverse plastics engineering custom fabricator and marketing company serving customers around in the following industries like Chemical & Process, Engineering Industries, Textile processing, Petrochemicals, Pulp & Paper Industries, Pharmaceuticals, Salt & Marine, Food & Beverages, Steel Industries, Power Plants and Oil & Refinery Industries. Our designers take your concepts and work them into detailed, fully engineered equipment. We hold technology in the field of pollution control to the most aggressive air streams and in Electrolyte cooling for zinc refineries. A process for roller coatings used in the steel industry is patented.